FIU women are helping each other get ahead in their careers. The Women Faculty Leadership Institute (WFLI) is an annual program organized by the Office to Advance Women, Equity & Diversity (AWED), geared toward women faculty and designed to promote leadership and strategic career planning. In 2011, FIU received a three-year, $573,000 National Science Foundation (NSF) ADVANCE grant for their “Awareness, Commitment and Empowerment (ACE) of Women Scientists at FIU” project, designed to facilitate the hiring, retention and promotion of women in science and mathematics. Suzanna Rose, associate provost for Women, Equity & Diversity, and a principal investigator on the grant, saw a need for programs that fostered a sense of community among women faculty members. One of the goals of ACE is to empower women faculty at FIU through the creation of innovative workshops, which would shed light on the nature of the biases and obstacles often faced by women in academia and provide best practices on how to overcome these obstacles. 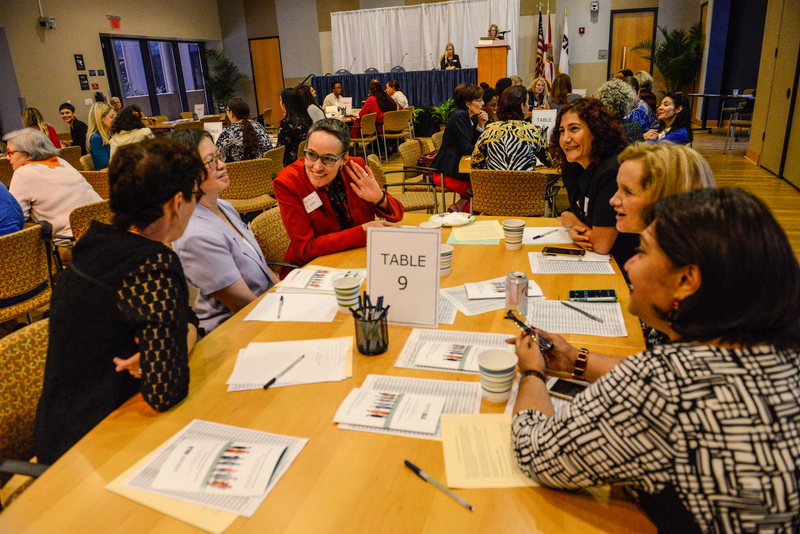 The success of the early WFLI workshops grew, with the 8th annual FIU Women Faculty Leadership Institute being held last month and attracting about a hundred women faculty across all disciplines. This year’s topic was networking and globalization, while past years focused on themes such as assertive communication, gender and negotiation, and emotional labor. Frazier is deeply familiar with WFLI. Not only is she currently one of the program’s coordinators, but she has attended all the workshops since its inception. “It’s a highlight of the year. There are always great speakers and interesting topics, and I can reconnect with friends, some of whom I only see at WFLI,” she says. Their experiences underline one of the main goals of the program, which is to provide an opportunity for women faculty members at the university to connect with each other. It can be easy for faculty members to lose themselves in their own research or department, but WFLI provides a forum for expanding social networks and discovering the great work being done by others. This sense of camaraderie is echoed by Meredith Newman, vice provost for Faculty and Global Affairs. She was part of this year’s opening welcome and has delivered keynotes at past WFLI conferences. “The institute represents a unique opportunity for our female faculty. Now in its eighth year, it has become firmly established as the “go to” event – to learn from scholars around the country, to share our stories, to support one another and, in the process, to sharpen our leadership skills. If leadership is mostly about valuing our colleagues and building stronger relationships, then participating in the annual WFLI is a must,” she says. The leadership skills taught at WFLI have already created tangible results on campus. A few years ago, one of the activities was to sit down in small groups and create lists of what female faculty members wanted to see at FIU. A common suggestion among the groups was an office dedicated to promoting women’s issues. The Council for Women and Minority Faculty, led by its chair Yesim Darici, director of the Center for Women’s and Gender Studies, proposed the idea of establishing such an office to Provost Kenneth G. Furton. AWED was founded in 2016 with the mission to achieve and sustain faculty equity and diversity as an essential element of FIU’s academic excellence. Additionally, the success of ACE and the popularity of the original workshops helped lead to another NSF ADVANCE grant in 2016, this one for $3.2 million and aimed at developing strategies to increase the number of women and minority professors in science, technology, engineering, mathematics and the social and behavioral sciences at the university. “We may not always realize it, but we’re stronger together,” says Rose. This year’s WFLI was co-sponsored by the Office to Advance Women, Equity & Diversity, the Center for Women’s and Gender Studies, the College of Business, the Office of Women in Medicine and Science, the Herbert Wertheim College of Medicine, the Center for Leadership, and FIU’s NSF ADVANCE Grant.